Out of curiosity, if you drive offroad with a car, does it always take the same damage no matter the speed or can you avoid fatalities with driving very slowly? Does this mean we can power player built bases now? Yep, it's based on current speed, you still gonna damage it, but by going slow, it should be ok. Seems like new update enabled godmode for everyone, no damage is taken no matter what. Any idea how to fix this? To be more precise - you get healed instantly. No mods enabled, all worked before last update. Will survival mode have this option enabled by default? So I have been playing for the last 2-4 days now and what an amazing addition cars are to the game, they allow for mobile bases and require maintenance to keep running just such a great addition. One feature I'd request is maybe cars having licence plates along with the matching key having the plate number "attached" because I found it hard to determine what key fitted what car once I've collected and maintained a few of them and since there are very few car models determining the key based on appearance is ineffective. It looks like a debug file was left in by mistake making players unkillable and spawning with vehicle-related items. Deleting media/lua/client/debug.lua should fix it. Just throwing out some issues with vehicles that i found. when getting out of the car on the railroad track bridge can make it so you can no longer enter the vehicle for example if the doors entry highlighted square is blocked you can exit but never enter. 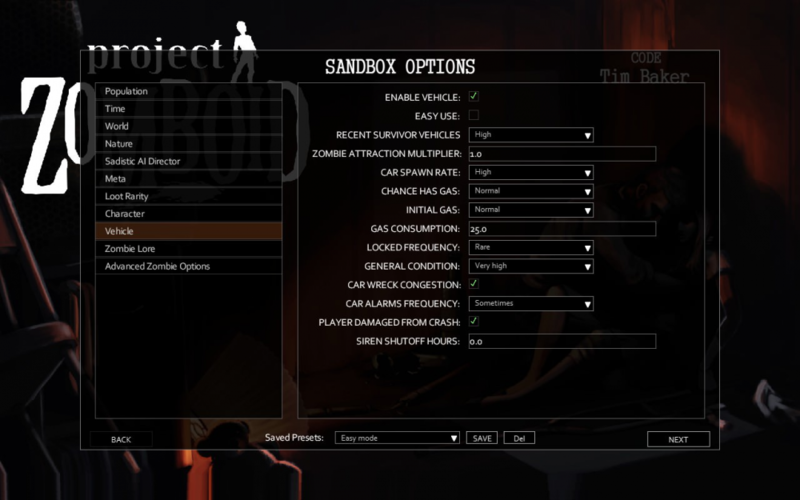 second locked car doors can be opened from the outside when going into the vehicle menu and selecting a window and opening it from the outside then simply walking to the open window and entering the car, makes no sense. this is the setting on my vehicles spawn. Right now farm houses have no vehicle spawns at all. Each time I put it on the beta, it downloads it, then my windows defender says quarantined virus, apparently it's a Trojan virus, what is happening?? Also I have tried multiple times, and the download never ends, please, help? Can't r produce it. The game downloads Ok through Steam on my end. Windows Defender doesn't seem to pick it up. Maybe a false positive? There seems to be little info about the trojan mentioned on Discord. Ok thanks @Snakeman, I'll try that. I'm having trouble getting the trunk inventory to show up. I'm able lock/unlock (I press E and get an unlock sound), but the container won't show up. Got the trunk once, not sure why it worked that time. All trunks above 50% condition. Tried on three different vehicles (all cars of some sort). Anyone else get this? PS Love the new bounce rate on forest travel! PPS I still think default gas in vehicles could be (much) higher... ran around half of muld and found only 3 cars with gas in them. Are you the same person who reported this in the Steam Bug Tracker by the way? My gas consumption is at 1. Did i screw my settings or did you change yours to 25? I just started a new game and I can say the vehicles help out lots early on, though I cannot speak for later in the game. I spawned in Rosewood this time and once I found a suitable possible home in the gated community, I took a car and drove all the way to the West Point drug store for axes - to save time. I'm rather annoyed that when zombies walk towards you when you're driving past, your character still gets panicked, and I feel like if it was in the zombie apocalypse and I flew by a zombie at 60 MPH, I wouldn't get panicked. I would also like the air conditioner to work a little quicker so my character isn't forever waiting to become cooled off. Another addition I'd like to see is more damage from accidents. I hit a tree at 70~ MPH and only busted a windshield and my headlights, whereas in reality, I'd die. One other thing; I'd like to zoom out more in a vehicle so I can avoid hitting a tree at that speed when there's a corner I need to go around. Other than those 4 things, the vehicles have helped me out in my game play, more speeding up the process than making the process easier considering I still have the dead chasing after me. It's a great addition and I cannot wait to see more.